The Fan Page Freebie has come to an end. 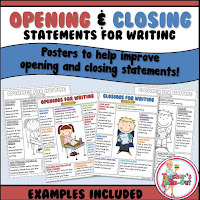 Opening and Closing Statements for Writing has 2 posters with a list of variety of ways to open and/or close writing. 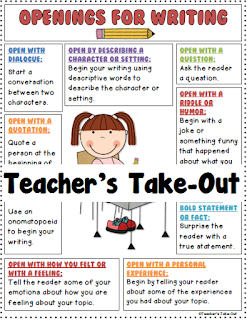 These opening and closing statements can be used for any genre of writing. They are both kid friendly and easy to use. Students pick from a variety of ideas for their openings and closings statements. 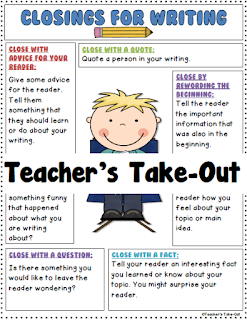 Be amazed how much better your students' opening and closing statements improve! Also included are black and white versions for those that do not want color. Purchase here on Teacher's Take-Out for a discount price.